Welcome to Bindings and Borders with Helen Coleman! This is a five part class, with each session devoted to learning a different skill. Each session is scheduled once a month. You may sign up for the entire series or for an individual class if you are familiar with one or more of the techniques. 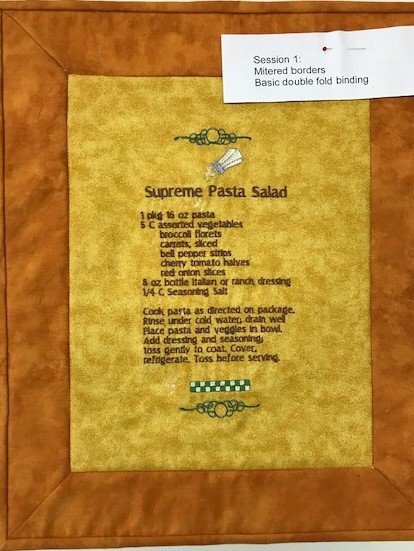 Session 1: You will learn how to attach the standard double fold binding to a quilt or wall hanging. You will also learn how to join borders to our squares using a mitered corner. You can choose to have your border and binding the same color as in our sample, or you can have different colors. Helen will show you how to do the binding by both hand stitching and machine stitching. Sewing machine must be in good working condition. Students must be familiar with the basic operation of their machines. Sewing machine is good working condition. Students need to be familiar with the basic operation of their machines. You will need a 1/4" foot with or with a guide.